The area around Wire Gully was resumed from Errowanbang Station in the 1950s as part of a Closer Settlement Scheme. The shearing shed at Wire Gully belongs to a farm created under this scheme and demonstrates the continuing importance of wool production in the area (Edward Higginbotham, 2009). 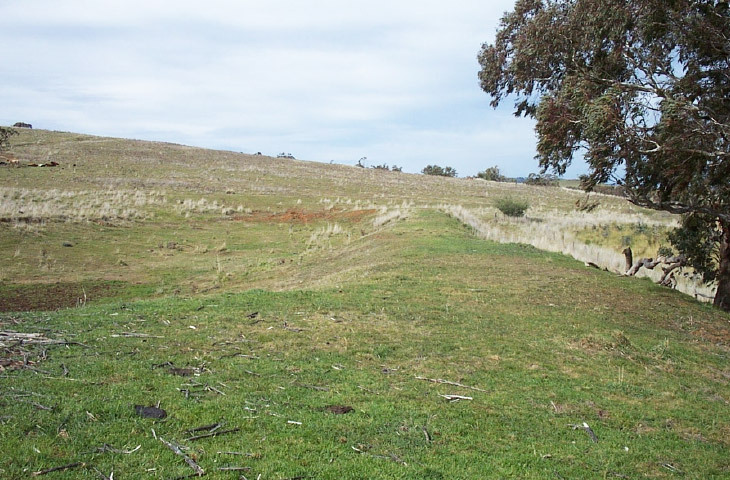 The Village Reserve at Wire Gully was notified on 23 December 1861, but, like many others in rural areas, was never taken up for village purposes. Portion 7, north of the Village Reserve, was purchased by John Savory Rodd, one of the investors at Cadia and a well known speculator in mining lands. Portion 8 and 9 to the east were taken up by William Lawson, as part of the Errowanbang Estate. William Lawson was another landholder to invest in the mines at Cadia. The Wire Gully Diggings was the location of a small gold find in the 1880s or 1890s. The area was worked under a series of gold leases. The early lessees were the owners of the Errowanbang Estate, but they are likely to have contracted miners to do the actual work. The Jarvis Brothers were reported working on Flyers Creek nearby in 1882 and in the 1890s. They may have also worked at Wire Gully in the 1890s. Further work was undertaken at Wire Gully from 1897 to 1910, with the Jarvis Brothers responsible for alluvial workings and some mine shafts. L. A. Tom exploited a quartz mine in 1903. A water race was constructed from Flyers Creek to take water to Errowanbang, but was also diverted to provide water for gold sluicing. Mining recommenced for a short period from 1933 with the Chellas Party finding a small patch of rich ore. The St Jude Wire Gully Gold Mines NL was formed in 1933 to exploit the new find. In 1934 a battery was erected, together with the digging of a mine shaft and drive. The mine ceased in 1936, failing to raise more capital, although processing of tailings continued into 1937. 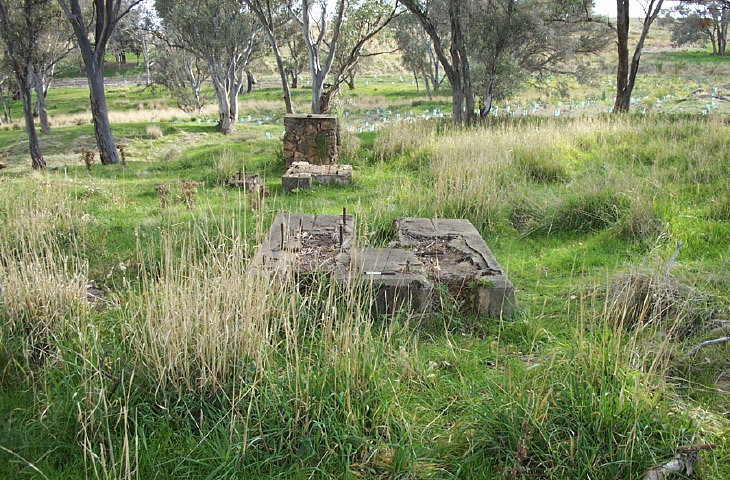 The gold mining at Wire Gully was typical of small finds in the Central West of New South Wales, exploited by landholders and others. Similar gold mining activity was undertaken at Cadia from the 1870s onwards. This part of the Errowanbang Estate was resumed by government in 1951 and then divided into smaller holdings under a Closer Settlement Scheme. One of these farms was centred on Wire Gully. 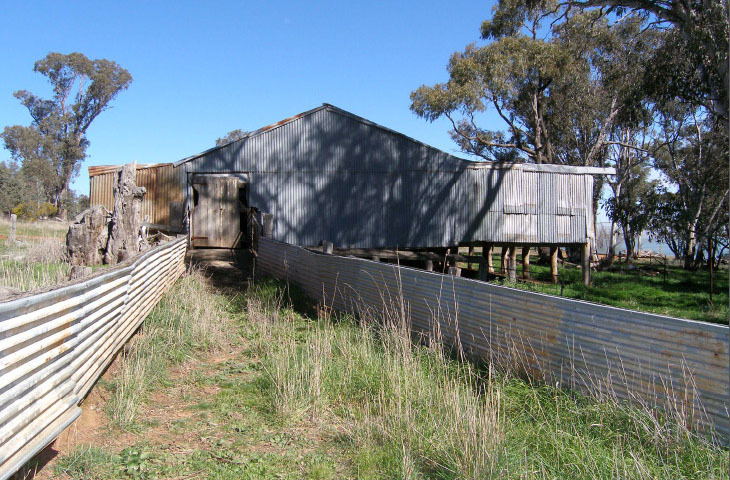 The importance of sheep farming in the area is demonstrated by the surviving 2-3 stand shearing shed. With the encroachment of mining, site survey of these mining remains and farm buildings was completed in 2010. 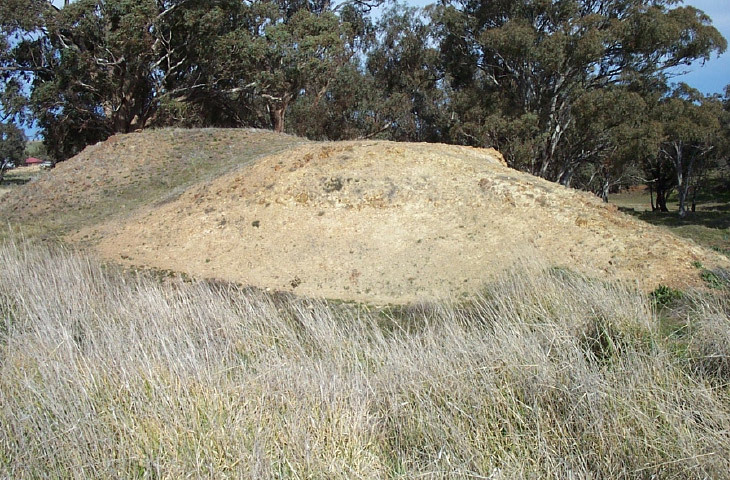 Mullock heaps pinpoint the locations of mine shafts at the Wire Gully Gold Diggings (Edward Higginbotham, 2002). The stone and cement engine beds are all that survive of the stamper battery, constructed in 1934 (Edward Higginbotham, 2002). 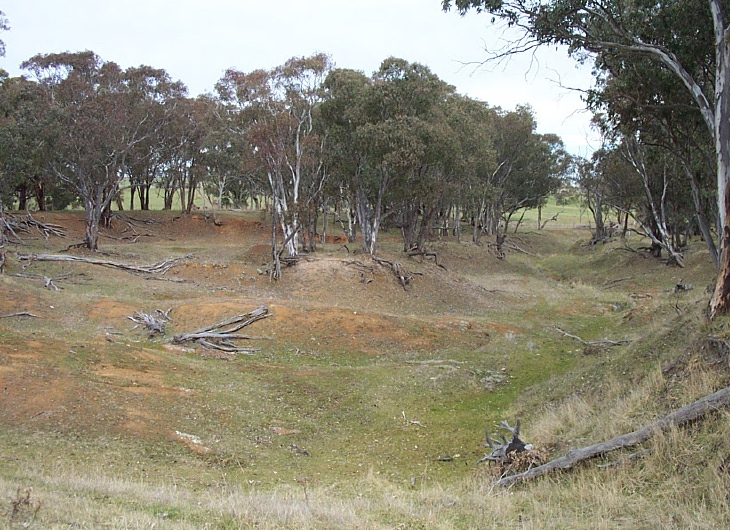 This large dam at the head of the Wire Gully Gold Diggings provided water storage for sluicing further down the creek (Edward Higginbotham, 2002). The eroded water course is clear evidence of gold sluicing operations (Edward Higginbotham, 2002). The water race from Flyers Creek was constructed c. 1900 to provide water for Errowanbang Station. 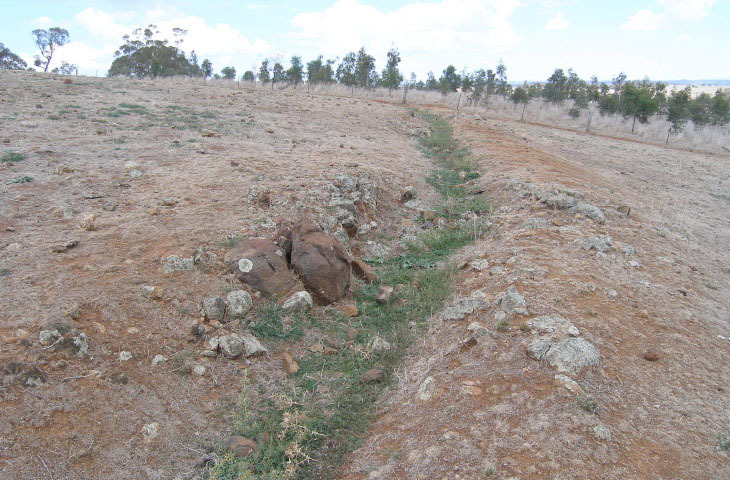 A branch led to the Wire Gully Diggings (Edward Higginbotham, 2007).